Today's ride was sponsored by Kevin. I set out a little later than hoped (noon), but made up for my procrastination with serendipitous exploration. I found a maze of winter trails and unplowed four-wheel drive roads networking through the woods just north of Skyline Drive. For a mile I'd plow through untapped snow, only to suddenly find myself on a well-traveled snowmobile trail, cascading over packed waves of powder. Then I'd hit the rutted and icy roads, bounce around for a bit, take a left turn and find myself up to my pedal strokes in powder again. 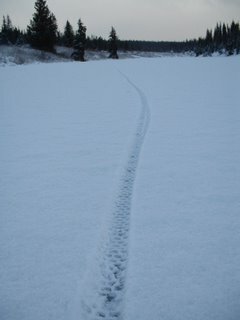 Along the trails I came across two dog mushers. One stopped to tell me the trail I was on was a dead end. "It ends at my house," the man told me. His 4 or 5-year-old daughter was clinging to the cargo side of his sled. Four restless huskies whined and nipped at the air. "I'm sorry," I said. "I didn't realize this was a private trail." "That's OK," he said. "It's not like you're on a snowmachine or anything." As he pulled away I could hear his daughter say, "Daddy, daddy, was that a bicycle?" Very knowlegable folks such as mags (who, by the way, is a future Olympian) have asked me why I don't enjoy all this God-given white stuff in more natural ways, such as skiing. And I do understand the importance of cross-training to stay in good athletic shape (I do run from time to time.) But these rides, especially the trail rides, are as much about gaining skill as they are about building a solid set of quads. I am a rookie in the most unapologetic sense. I had never even seen a studded tire (bicycle or otherwise) until this year. And I don't have much time, so I practice - any free moment I have. I know that my success depends on my level of confidence, even more than it does on my level of fitness. Earlier today, I thought I had a good idea for a post. But Geoff and I just went to see King Kong, and my brain is a little bit mushy. 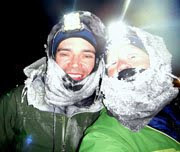 Kevin, my sponsor for today, suggested I do a Susitna 100 gear post - what I'm planning on using and what I still need. This sounds like a good idea (I admit it. I'm hoping to receive suggestions and recommendations all around.) So I'll pencil that one in for tomorrow. Sounds good, Jill! You're looking good on miles, by the way! Your reason for staying on the bike, instead of cross training, makes perfect sense. No doubt about it, Jill. Cross training should only be a way to mix it up a bit, not to undercut specific on-the-bike training. 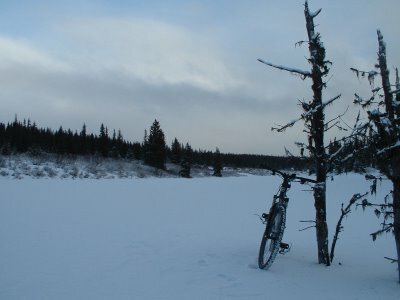 Riding on frozen lakes is my favorite thing to do. You're getting a better winter up there than we are here, we're getting some sort of global warming winter where the lakes and rivers still have slush on them. do you have studded tires? 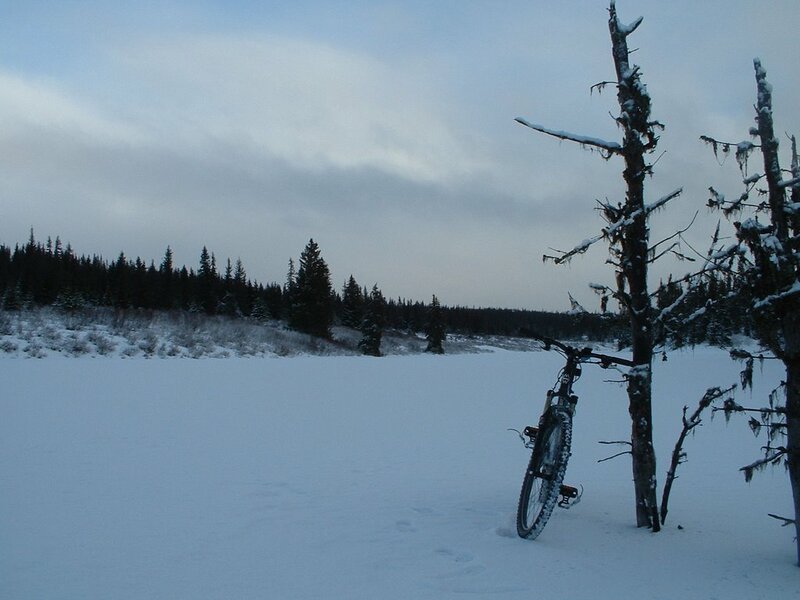 biking in the snow sounds fun and i've always wanted to go to alaska. i might have to make a trip and try it, as soon as i get out of my assignment here in india. 108 snow miles in 7 days, impressive, to me at least. I almost thought I knew where you were riding when you made reference to Skyline Dr, as that's the street that switchbacks up the hill behind Eagle River. Doesn't sound like the same road, however. I don't think I have any gear recommendations for you, but I would recommend training with your gear on once in a while. The more weight you can get on your bike and the less weight you can get on your shoulders, the better. If everything's weighed down on your back, it's going to tire you out quicker (even if it does keep your back warmer). Also, you might find the bike more difficult to balance with all the stuff on it. If you look around, you can probably find a saddle pack that you can hang over your top tube (although you do have a funny-looking top tube). Find one that's not too bulky, as you dont' want it to interfere with your legs while you pedal. I guess I did have a gear recommendation after all. Who knew?